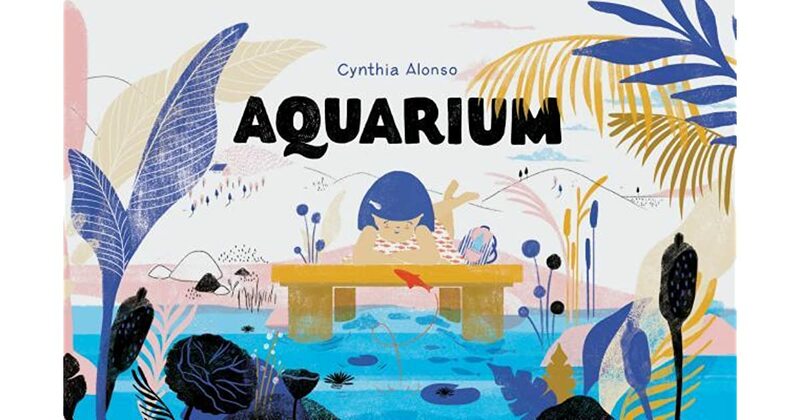 Summary: A little girl heads down to the end of her dock in this wordless story to watch the fish in the ocean and dream about swimming with them. When an orange fish leaps out of the water, she scoops him into her water bottle and runs home with him. She creates a complex network of bowls, pitchers, and hoses for the fish to enjoy, but ultimately senses that he would rather be in the ocean. Back into the water bottle he goes, and she races him down to the edge of the dock. She gives him a final kiss goodbye, then lets him go back home again. 40 pages; ages 3-7. Pros: A beautiful wordless picture book by a new artist from Argentina. The story is complex enough to be interesting, yet straightforward enough for even the youngest listeners to piece together from the illustrations. Cons: It wasn’t entirely clear to me how the fish got into the water bottle.